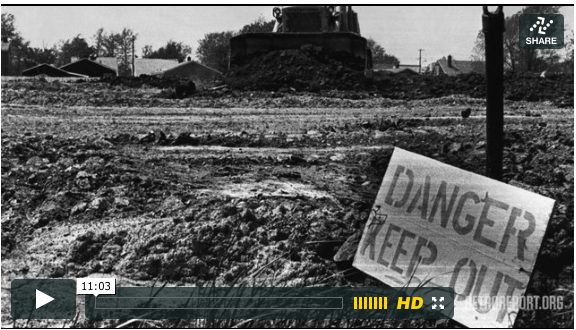 Few words did more to raise fears of environmental disaster over a generation than “Love Canal.” The small neighborhood outside Niagara Falls became big news when toxic chemicals – buried three decades earlier – began oozing from the ground. The script that played out – new at the time – today feels like a long-running play: Fears, confusion, denials, public demands – demands for information and safety that largely went unheard and unacted upon. Until, that is, compelled by one local woman who kept up the fight, the government not only helped the residents move out, but eventually set up the landmark Superfund legislation in 1980. But instead of that being the end of the story, some 15 years later, spurred by refurbished homes at below market prices, people moved back to Love Canal. And now it turns out some of them might have gotten more than they bargained for.